The Dlin/Fischer Clinical Research Award is presented for significant achievement in clinical research and the best paper submitted for presentation at the annual meeting. There is no application or nomination procedure for the award. Rather, individuals who submit the top-rated abstracts are invited to submit a paper to vie for the award. The award is named for Barney M. Dlin, MD, FACLP (Academy president 1983-84) and H. Keith Fischer, MD, FACLP (Academy president 1975-76), corroborators on many research projects and papers. Barney “Ben” Dlin, who passed away in December 2008 in his 90s, played a significant role in elevating the Academy into a leading psychiatric organization and made many important contributions to psychological aspects of both coronary artery disease and inflammatory bowel disorders. Dr. Dlin wrote about his first job as a doctor in his autobiography, Country Doctor: A Memoir. As a result of his experience, he believed that “every student of medicine should spend time in rural practice . . . no matter what specialty is pursued.” Thomas Wise, MD, FACLP, provides a tantalizing review of the book in the November-December 2001 issue of Psychosomatics. H. Keith Fischer was 79 when he passed away in December 1995. He was clinical professor of psychiatry at Temple University, where he’d been on the faculty for 50 years and where he started the first open psychiatric inpatient unit and the first art therapy program in Pennsylvania. In the January 1996 Academy Newsletter, his cohort Barney Dlin wrote a memorial that is reprinted here. 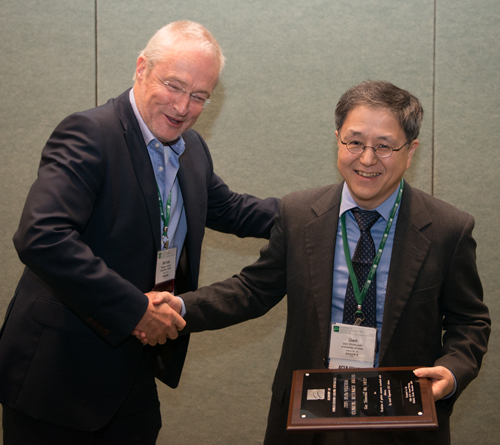 Gen Shinozaki, MD, FACLP (right), gets a hearty congratulations for the 2018 Dlin/Fischer award from Michael Sharpe, MD, FACLP, at the Annual Meeting in Orlando, FL. 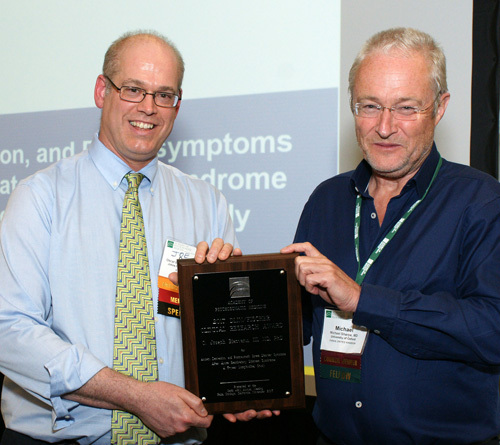 O. Joseph Bienvenu, MD, PhD (left), received the 2017 Dlin/Fischer award from award presenter Michael Sharpe, MD, FACLP, in Palm Springs, CA. There is no application or nomination procedure for the Dlin/Fischer award. Rather, four to six individuals who submit the highest mean-ranking abstracts for oral papers at the annual meeting, as rated by the Oral Papers & Posters Subcommittee, are invited to submit a paper to vie for the award. Authors cannot be a finalist for this award if they have received it within the previous four years. Finalists may accept or decline the offer to compete. All those who decline or are not selected will present their paper during the regular Oral Papers session of the meeting. Please note: The submission length is strictly observed and submissions longer than the 10-page limit will be returned to the author for editing. Tables, figures, and references are not included in the page count and may take up additional pages. If the paper has already been published, a PDF reprint may be submitted in lieu of a shorter submission. The papers will be judged by the Research Subcommittee. The author who submits the winning paper will present the paper as a featured one-hour lecture during the annual meeting and receive a $250 honorarium.